I love it when a plan comes together. I also love it when men in giant foam rubber animal suits with over-sized heads fight one another. It goes without saying that I love the conspiracy of how and why Brandon Hanning became the Ohio University mascot. He had one good reason: Hanning simply wanted to attack Ohio State mascot Brutus Buckeye. 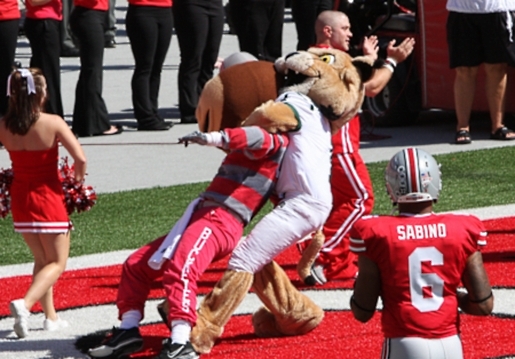 He got his wish on Saturday, when before the game of Ohio versus Ohio State, Ohio’s Rufus the Bobcat attacked Ohio State’s Brutus Buckeye before the game, right in the middle of the end zone. “It was the whole reason I tried out (to be Rufus) last year,” Hanning said. “I knew we were going back to OSU this year, and I wanted to tackle Brutus.” Hanning, age 19, doesn’t even go to Ohio University. He’s a student at Hocking University, having dropped out of OU after a semester. However, that doesn’t mean he’s forgiven and forgotten about his hated rivals, The Ohio State University. When the chance arrived, Hanning went Godzilla on Brutus not once, but twice. He got banned for life from all Ohio University sports, but no doubt the ban was worth it.